I could wait no longer. 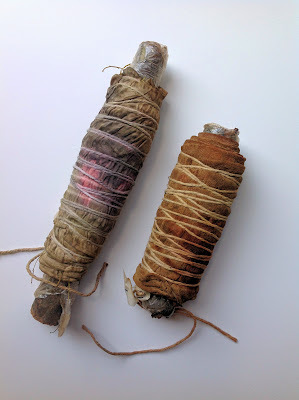 This is what emerged from the 2 bundles I wrote about a couple of days ago. I like. 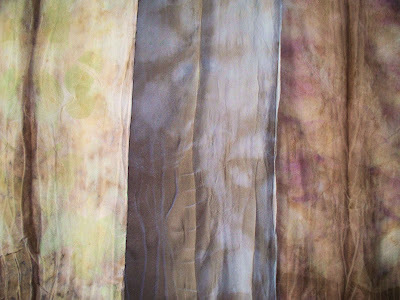 The scarf on the left is silk chiffon and is a little more golden in color than how it appears. The scarf on the right is a cotton and silk blend. This is what emerged from the bundle that was fermenting. There was a lot of copper influencing the rose leaves. The resulting colors are so interesting. This was a piece of cotton fabric. 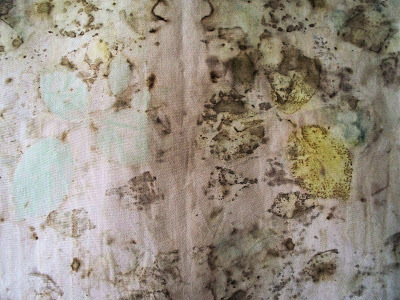 Eco-printing is such an interesting technique. Those who have practiced for a number of years can usually predict the outcome of their combinations. The rest of us just marvel at the surprises. I have kept notes on all the recipes I have tried so far but there are many more I’m considering. Every day I wander out into my small yard and look at each plant there with a different eye. The freezer is getting very full with items not edible and the boxes of drying foliage is starting to fill up the garage. I’m enjoying every minute of it! The past 4 days I have prepped several more eco-print bundles. This week, however, there will be a few bundles ready to be revealed. There is one still fermenting in the dye-bath so cannot even begin to know what it might grow up to be. 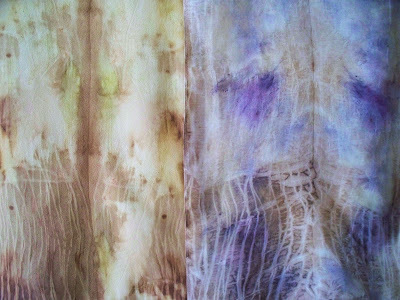 The two pictured were processed together then removed from their dye-bath and left to sit it out for a couple of weeks. Interestingly, they were processed together. The colors of each are so different from each other. One piece is silk chiffon and the other is a cotton/silk combination. Both fabrics were presoaked in alum. It appears that the fabric as well as the plant materials used for printing make a significant difference in the outcome. Stay tuned for the unveiling. It will about 4 more days. Prepared 3 new bundles. All a bit different than the last group. Anxious to see what happens with these. I do keep finding more information on what others have tried and keep wondering why I got rid of an aluminum stock pot and a couple of sun tea jars. This truly is a ‘just about anything goes’. Now, am I brave enough to use a tin-lined copper pot? Meanwhile, I’ll try to be patient for a couple weeks and spend the time collecting more plant materials. Each time I walk into the garage, however, I catch the wonderful fragrance of cinnamon (found some old cinnamon sticks and added them to the dye bath). It makes me even more anxious to see the results.